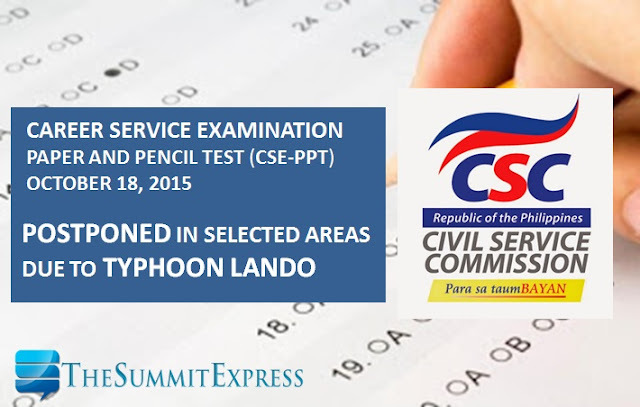 MANILA, Philippines - The Civil Service Commission (CSC) announced on Saturday the postponement of the October 18, 2015 (Sunday) Career Service Examination-Paper and Pencil Test (CSE-PPT) in all testing centers in some regions. The cancellation was due to the inclement weather situation that may be caused by Typhoon Lando. State weather bureau on its 5:00pm update said that 'Lando' has further intensified as it threatens the provinces of Aurora, Isabela and Northern Quezon. Signal No. 4 (winds of 171- 220 kph is expected in at least 12 hours) has been announced over Aurora Province. CSC said that affected examinees are advised to standby for further announcements regarding the rescheduling of the exam. The CSE is a general ability test designed to measure an individual's preparedness to enter government service. Passing the CSE entitles one to either a Professional or Sub-Professional career service eligibility which is one of the basic requirements for permanent appointment to career positions in government, except for positions that involve the practice of profession or are covered by special laws.